Food retailers are rolling out online and in-store initiatives to drive back-to-school sales this season, including a growing effort to recruit parents to pledge to provide healthier lunches for their kids throughout the year. Supercenter operator Meijer Inc. is among the chains seeking a share of what the National Retail Federation (NRF) estimates will be $83.6 billion in spending for back-to-school merchandise, including back-to-college spending. Last week the Grand Rapids, Mich.-based chain said it has added key back-to-school items to its grocery delivery service — available as soon as one hour after the order is placed through its partnership with Shipt — and reduced prices on more than 300 of its most popular items. The selection includes 200 items priced at $1 or less. “Everyone is looking for the best combination of selection, convenience and low prices, so we hope providing this new way to shop and save time is going to help customers be better prepared for back to school and maximize their fun this summer,” Michael McKenzie, back-to-school buyer at Meijer, said in a statement. He said back-to-school business at Meijer has doubled week-over-week in late July. While many supermarkets have seen their share of back-to-school nonfoods sales evaporate over the years, they increasingly view this season as a prime opportunity to promote food items, often with a particular focus on nutrition. At Tahlequah, Okla.-based Reasor’s, for example, most of the chain’s 18 stores are conducting some nutrition-related activities related to back to school, said Heather Steele, retail dietitian at a Reasor’s location in Broken Arrow, Okla. The events are part of the chain’s “Eat Right Feel Great” effort to promote a healthy diet. At Steele’s location in Broken Arrow, she is building a special display this year to promote the “Power Your Lunchbox” campaign from Produce for Kids, a Florida-based, cause-marketing organization that seeks to educate consumers about eating healthy with fresh produce and raises funds for children’s nonprofit organizations. The Reasor’s display includes recipes and ideas for items to include in a healthy lunch, along with accessories such as plastic sandwich bags and lunch buckets. The display also includes a sign-up area where customers can “pledge to pack a healthier lunchbox.” For each pledge, Produce for Kids, which is backed by fruit and vegetable suppliers, donates $1 to Feeding America. This is the second year that Produce for Kids has extended the campaign to involve retail dietitians, said Amanda Keefer, director of marketing communications at Produce for Kids. The group mailed out 380 Power Your Lunchbox kits to retail dietitians in the U.S. and Canada in preparation for the campaign, which officially launches Aug. 7. The effort is being supported with a social media effort using the #PowerYourLunchbox hashtag. 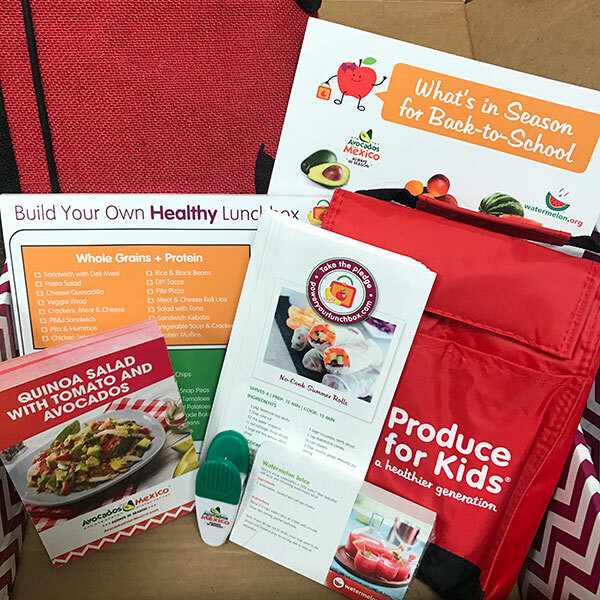 The kit includes dietitian-approved recipe cards and other materials to help educate families about building healthy lunches for children to take to school. As part of the program, one of the produce sponsors of the campaign, NatureFresh Farms, will promote the Power Your Lunchbox Pledge through its mobile greenhouse, the Greenhouse Education Center, as it tours the Northeast U.S. and Southeast Canada. The tour includes August stops at Wegmans supermarkets in upstate New York and at Zehrs and Loblaw supermarkets in Ontario. Consumers will be able to take the pledge via iPad when they visit the mobile greenhouse, according to Keefer. Overall, U.S. back-to-school sales are expected to increase about 3% to 4% this year, according to a report last week from Fung Global Retail & Technology. Consumers appear to be shifting their purchases away from office supply stores, department stores and specialty stores and spending more at mass merchants such as Target and Walmart and off-price chains instead, the Fung report found, citing research from Deloitte. Bentonville, Ark.-based Walmart is promoting in-store back-to-school shopping with a “heroes” campaign in which employees will don yellow capes and be available to assist customers in the back-to-school merchandise aisles. Thirteen percent of consumers said they plan to shop at traditional supermarkets for back-to-school supplies, compared with 81% who will shop mass merchants (up 24% from a year ago) and 40% who will shop dollar stores, according to the Deloitte research. Thirty-six percent said they will shop online-only stores. Several states around the country are set to kick off sales-tax holidays for school supplies in the coming days and weeks — many of them begin Friday, Aug. 4 — and handful already have, according to the Fung report.